Davis and Tarik Cohen are left atop the Bears' depth chart after the team traded Jordan Howard to Philadelphia on Thursday, Tim Stebbins of NBC Sports Chicago reports. 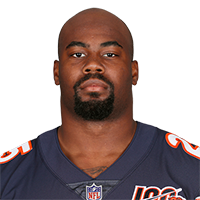 The Bears are expected to sign Davis, Ian Rapoport of NFL Network reports. Analysis: With this acquisition, the writing is on the wall for Jordan Howard's tenure with the Bears. Assuming Howard isn't around next season, Davis will form a two-pronged backfield with Tarik Cohen, who recorded 71 catches, 1,169 yards from scrimmage and nine touchdowns last season. Meanwhile, Davis himself posted 34, 728 and five, respectively, with the Seahawks. A similar breakdown between the two can be expected in the fall. Davis rushed four times for 10 yards and caught both targets for 22 yards in Saturday's wild-card loss to the Cowboys. He also ran in a two-point conversion. Davis (foot) won't carry an injury designation into Saturday's wild-card matchup with the Cowboys, Gregg Bell of The Tacoma News Tribune reports. Analysis: The Seahawks haven't completed their final practice of the week, but there's apparently no concern about Davis' status for the weekend after the foot issue limited his participation in Wednesday's session. He'll fill his familiar duties as the Seahawks' top pass-catching option out of the backfield Saturday, a role that netted him 34 receptions for 214 yards and a score during the regular season. Davis (foot) was listed as limited on Wednesday's practice report, John Boyle of the Seahawks' official site reports. Analysis: After being tagged with a DNP on Tuesday's initial report, Davis took part in some individual drills Wednesday, putting himself on a path to active status Saturday in Dallas. He was a close second behind starter Chris Carson in terms of offensive snaps Week 17 against the Cardinals -- 25 versus 32 -- but his nine touches paled in comparison to Carson's 20. Expect the status quo to reign between the two if Davis is active this weekend, as expected. Davis was a non-participant at practice Tuesday with a foot injury, John Boyle of the Seahawks' official site reports. Analysis: Davis likely suffered the foot injury at some point in Sunday's win over the Cardinals, though nothing was reported during or after the game. The Seahawks generally take a cautious approach with injuries early in the week, so an absence from practice Tuesday doesn't necessarily mean Davis is in serious danger of missing Saturday's playoff game at Dallas. His practice participation Wednesday and Thursday should provide a better idea of whether his status is in doubt. Davis rushed seven times for 44 yards and a touchdown while hauling in two of three targets for 12 yards in Sunday's win over the Cardinals. Analysis: Although Chris Carson continues to command Seattle's backfield, Davis was a serviceable change of pace, scoring for the first time since Week 10 with a 17-yard touchdown late in the third quarter to extend the Seahawks' lead. Davis also outplayed rookie Rashaad Penny, who accrued just six yards on four carries. Going into the first round of playoffs against the Cowboys, coach Pete Carroll likely will award either Davis or Penny with the top backup role to Carson based on a hot-hand approach. Davis rushed seven times for 31 yards and couldn't haul in his only target in Sunday's 38-31 win over the Chiefs. 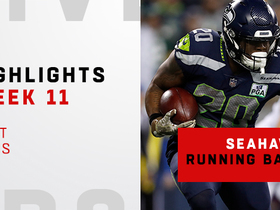 Analysis: Davis barely benefited from Rashaad Penny (knee) being inactive, as he was overshadowed by Chris Carson's 22 carries. However, three of Davis' seven rushes were in the red zone, so he's still getting opportunities to score. If he continues to log this few touches without Penny in the lineup, Davis will struggle to scrap together fantasy value without finding pay dirt. Davis rushed five times for 21 yards and caught all of a team-high eight targets for 63 yards in Sunday's overtime loss to the 49ers. Analysis: Despite being the main backup to Chris Carson with Rashaad Penny (knee) out, Davis was barely used in the running game, but he made up for it substantially in the passing game. Davis didn't get carries because of how Carson was rolling with 22 rushes for 119 yards (5.4 YPC) and a score, but it's a promising sign that he could make up ground through the air. Still, if Penny returns in Week 16 against the Chiefs, Davis could see limited opportunities again. Davis is expected to work as the top understudy to starting running back Chris Carson in Sunday's game against the 49ers with Rashaad Penny (knee) ruled out for the contest, Gregg Bell of The Tacoma News Tribune reports. Davis rushed three times for 22 yards and caught a pass for five yards in Monday's win over the Vikings. Analysis: Davis received all of his touches in on drive at the end of the second quarter, and two of his carries came in the red zone. The fourth-year pro hasn't rushed more than four times in any of the last four games and is clearly the No. 3 running back behind Chris Carson and rookie Rashaad Penny. Fantasy owners still clinging onto Davis are overly optimistic at this point. Davis rushed four times for 10 yards in Sunday's win over the 49ers. Davis had four carries for 14 yards in Sunday's win over the Panthers. He failed to haul in his only target. Analysis: This is the second straight week Davis logged four carries, as Chris Carson continues to spearhead Seattle's backfield with 16 rushes for 55 yards. Davis can be safely left off fantasy rosters as long as Carson's healthy. Moreover, even if Carson were to succumb to injury, Davis would have to battle rookie Rashaad Penny for touches. Davis (knee) was listed as a full participant on the Seahawks' estimated injury report Thursday, John Boyle of the team's official site reports. Analysis: Davis' workload remains behind only Chris Carson within Seattle's backfield. That said, rookie Rashaad Penny has nearly equaled Davis in terms of touches over the last two games (20 versus 21). Assuming status quo reigns moving forward, Davis and Penny seem destined to split RB reps that don't go to Carson. Davis was limited at Wednesday's practice with a knee injury, John Boyle of the Seahawks' official site reports. Analysis: With no indication the injury is serious, Davis seems to be on track to play in Sunday's game against the Panthers. His workload is the real concern, as he was mostly limited to passing downs in the Seahawks' Week 11 win over the Packers. With both Chris Carson and Rashaad Penny getting carries, Davis may be stuck in a specialized role. Davis rushed four times for 26 yards and caught both of his targets for 24 yards in Thursday's 27-24 win over the Packers. Analysis: Davis had only one carry until his team's final drive, when the Seahawks were simply looking to run the clock out. 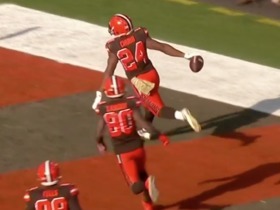 He was, however, the team's only running back to catch a ball in the contest. 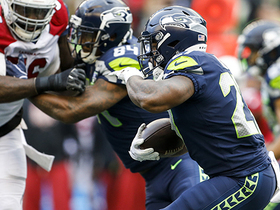 Now that Chris Carson is back in the mix, and with rookie Rashaad Penny displaying play-making ability of late, Davis' opportunities Week 12's game against the Panthers could be limited. With coach Pete Carroll naming Chris Carson the Seahawks' starting running back for Thursday's game against the Packers, Davis is set to work in a reserve role, Gregg Bell of The Tacoma News Tribune reports. Davis rushed 11 times for 58 yards in Sunday's 36-31 loss to the Rams. He also caught four of six targets for 22 yards and a touchdown. Analysis: In the fantasy realm, Davis' stats are comparable to rookie Rashaad Penny, who rushed 12 times for 108 yards and a score but didn't receive a target. Still, Penny averaged an extra 3.7 yards per carry. 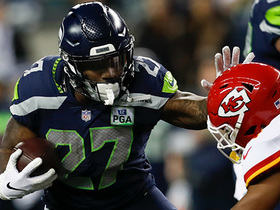 Regardless of if Chris Carson (hip) returns soon, fantasy players will be watching backfield pecking order shifts ahead of Thursday's game versus the Packers. 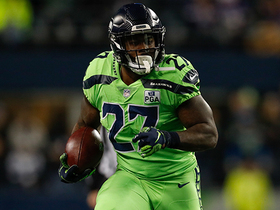 Davis is expected to start at running back Sunday against the Rams with Chris Carson (hip) inactive for the contest, John Boyle of the Seahawks' official site reports. Coach Pete Carroll said Davis looked good at practice this week while filling in for Chris Carson (hip) with the first-string offense, Brady Henderson of ESPN.com reports. Davis rushed 15 times for 62 yards in Sunday's 25-17 loss to the Chargers. He also caught seven of eight targets for 45 yards. Analysis: Davis benefited from Chris Carson aggravating his hip injury and exiting the game early. He out-touched rookie Rashaad Penny 22 to seven and truly strutted his pass-catching abilities for the first time this year, as he had 10 catches before this outing. If Carson's injury lingers into Week 10 against the Rams, expect Davis to log a hefty workload and rank as a solid flex option. With Chris Carson (hip) active for Sunday's game against the Chargers, Davis will likely work as the Seahawks' No. 2 back in the contest. Davis would be first in line to lead the Seattle backfield if Chris Carson (hip), who is considered a game-time decision for Sunday's tilt with the Chargers, is unable to play, Ian Rapoport of NFL Network reports. 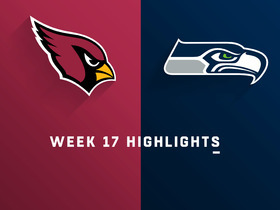 Watch the Week 17 highlights as the Arizona Cardinals take on the Seattle Seahawks. Seattle Seahawks running back Mike Davis has a wicked cutback to score the touchdown from 17 yards out. Seattle Seahawks running back Mike Davis fights off Kansas City Chiefs linebacker Anthony Hitchens for 10-yard gain. Watch the best runs from the Seattle Seahawks in their matchup against the Minnesota Vikings in Week 14. Seattle Seahawks running back Mike Davis runs 13 yards for a first down. 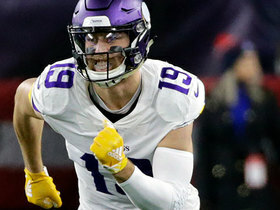 The "NFL Fantasy Live" crew give their bold fantasy predictions for the Minnesota Vikings and Seattle Seahawks Week 14 matchup. 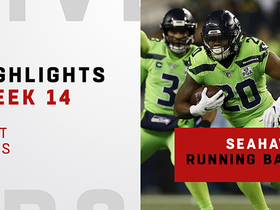 See highlights from the Seahawks' running back trio of Rashaad Penny, Chris Carson and Mike Davis in their win over the Green Bay Packers in Week 11 of the 2018 season on "Thursday Night Football." 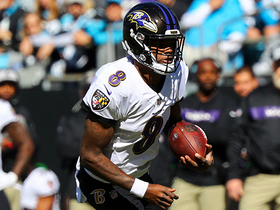 Find out which players you can add off the waiver wire to help your fantasy team in Week 11. 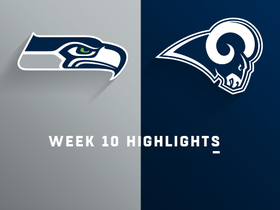 The Seattle Seahawks and Los Angeles Rams battle back and forth in Week 10, but the Rams emerge with the 36-31 victory.